Book Your Hunts with Mullins Guide Service! We offer Fully & Partially Guided Hunts. Our Fully Guided Hunt package is the way to go! You draw the tag, we'll take care of the rest! We will do extensive scouting and videotaping of your unit and the animals we find. We will present this to you when you arrive in camp and go over the game plans prior to the hunt. 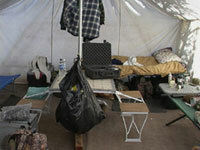 will have a camp cook and breakfast, lunch and dinner will be provided. All of our guides are knowledgeable in the proper field care of your trophy and will do all the packing chores and meat preparations for you. This package is the most hassle free and enjoyable one for you and can be either a 1 on 1 hunt package or a 2 on 1. For the 2 on 1 package, you will provide the second hunter which will cost each hunter less and you will get one guide to share. Every hunt can be custom tailored to fit your needs and guests are always welcome for an additional daily rate to cover expenses. We will never "overbook" a hunt and we will never have more than 4 hunters in any camp. We will always strive to make each individual hunt as memorable and successful as possible. To further enhance this point, we offer a video package as well that will provide you with a DVD so you can re-live your experience with family and friends for years to come. 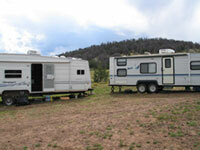 This is a great option for those with their own RVs, 5th wheels, or tents. The partially guided hunts consists of everything that we offer on a fully guided hunt except for camp accommodations and food. Your guide will go over the scouting report that they've done for your unit. From there together you and your guide will decide where you want to start your hunt depending on the method you'd like to use. The hunting methods can vary from spot and stalk to stands. Our guides are proficient in the art of calling with bugle calls and cow calls to bring the big ones in close. Like our fully guided hunts: We will take care of the downed game from field dressing, skinning, and packing out to trophy care, and transport to a processing facility. We will transport you and your game to a local processor where you can make arrangements with them on what you'd like to have done with the meat. Otherwise we can cut the meat into large chunks for you to put in coolers (you must provide coolers) for you to take to your hometown processor. The head, antlers, and hide can be taken to a local taxidermist of your choice. Your hunt includes the option of "in the field" housing in large deluxe wall tents heated by wood burning stoves or you may choose to stay in a travel trailer. By far, this is the most enjoyable and convenient way to experience your hunt. There is nothing like sitting around the campfire, talking about the days experiences, and determining tomorrow’s game plan! If you prefer hotel/motel accommodations, we also will provide transportation to and from the field each day of your hunt. We advise against this option only because we usually hunt in remote areas and you'll be getting up very early to make it to your hunting area before sun-up. Meals are provided by our camp cook!!! Fresh hot coffee and a quick breakfast will get you going in the morning. Packed lunches and a nice hot dinner round out the day. We will happily take care of any special dietary needs. We cannot provide alcoholic beverages due to liability issues, however you may bring your own to consume after returning to camp. Transportation to and from an airport can be provided for a small fee.